As a special project during World War II, the National Chapter IODE collected funds raised by provincial and primary chapters to purchase a Bolingbroke Bomber. During one week, IODE members raised $100,000. One chapter raised $335 after collecting and selling old gold and silver pieces in the summer of 1940. The bomber, known as “Ida”, it was flown by a Hamilton Squadron during the war, and was presented to the Canadian Government in 1940. As a matter of interest, the Canadian Warplane Heritage Museum is currently restoring a “Boly” which will bear the IODE crest on its nosecone. 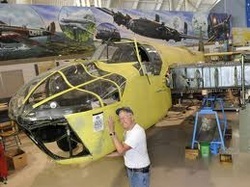 IODE has contributed significant funds to the restoration, which can be seen in the Canadian Warplane Heritage Museum, Mount Hope, Ontario.